This is the most important step which should never be missed! Never ever. No matter how lazy or tired you might feel. 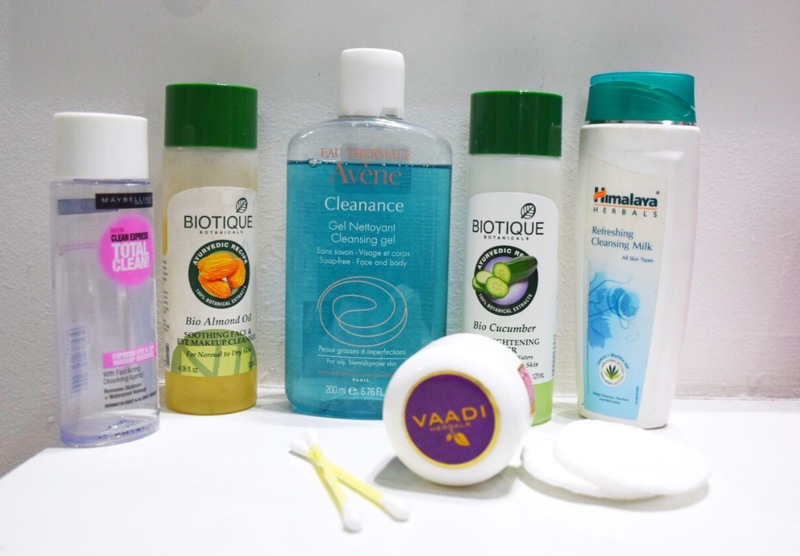 😓 Most of the time I manage with Maybelline Clean express makeup remover, which I absolutely love, but I do keep Himalaya Cleansing milk and Biotique makeup cleanser (because I need some change!). The biotique cleanser is perfect for removing heavy eye makeup. A little on the greasier side but it contains good ingredients anyway, so can be managed. For the first time I have invested (yes, literally invested) in Avéne Cleanance Cleansing gel. And so far, I am loving it to bits 😘. Look at the bottle, I’ve been using it (very very judiciously!) since 1st October and it seems it will go a long way. It is a gentle cleanser but removes the tiniest makeup residue very effectively! There is no dry/itchy feeling post wash and the fragrance is also very mild. It has made my skin super soft and those tiny little zits have disappeared! If you are looking for a cleanser which actually works, I highly suggest you to invest in this product. The only thing I do to take care of my eyes is using Vaadi eye cream. This cream is very greasy but is effective too. Once in a while (which is very rare) I apply castor oil on my lashes and eye brow. That’s it! And last but not the least, a Lip balm follows all kinds of routine (morning, mid-day, night, whatever) for me. So, what is your skin care routine for night? And which products/steps do you tend to skip like me? 😜Do share in the comments below. Lovely post and great choice of products! Simple and Neat routine! I’ve used Himalaya cleansing milk and it is very effective in removing makeup. I’ve just started using Maybelline clean express and liking it so far. You just can’t put Maybelline away once you’ve started using it. I really wish it came in bigger bottle but nevertheless, it is an amazing makeup remover. I think when it comes to night time skincare, it’s ok to splurge a little and get good high quality products. Mostly I end up skipping steps at night when i am very tired and just want to get it over with. I never really got into toner though. great post btw! Thanks Deepika for stopping by and reading my post. Yes, we all tend to be either lazy or tired enough to skip the steps. Nice products specifically Avéne Cleanance Cleansing gel. It work wonders for acne prone skin. Thanks for sharing. The older I get, the more I should do, but I really like simple and quick.